I mean, give Mike a break. Mike went 1-3 at his first event… Where he had Spit Flame and a Dragon. Then, to redeem himself, he went 2-2 in the one where he had a Banefire. His little red creatures were no match for Giganotosaurus. Patrick concedes that a man might be scarred by such an experience. I mean… GGGGG! But Mike insists that he wants to play it in Standard. Patrick points out that Verdurous Gearhulk is still legal in Standard. Mike likes Elvish Rejuvenator because, not slaved to basic lands, it can flip over a Desert on turn two or three. This not only sets up a three-to-five Ramp; it can get the first Desert you need for Hour of Promise. 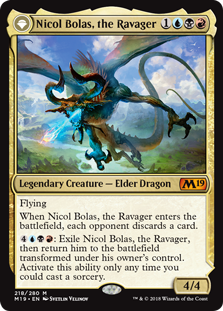 The main problem isn’t that a 10/10 for five mana — in Sealed Deck or no — isn’t formidable. The problem is that you really have to warp your mana around the ability to produce five green mana on demand. We already had Thrashing Brontodon. Now there’s Runic Armasaur. Ghalta, Primal Hunger is cake to cast when you have so many big bodies. 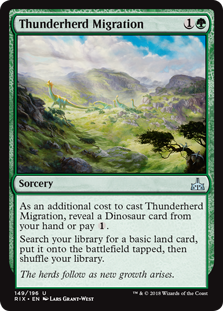 The secret is that at a critical number of Dinosaurs, you get to legitimately play Thunderherd Migration. Thunderherd Migration is the payoff! Most of the time we think about what we’re Ramping into as the payoff. But this is a case where we get to play one of the most powerful cards in the format… That no one else gets to play. So, what do you think? GG with the GGGGG? 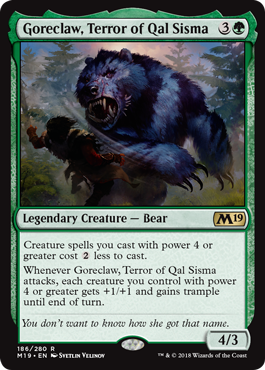 I know, I know… Goreclaw is not a 2/2 for 1G; but Bear it claims to be. Okay, okay… Let’s get past the Vorthos on this card. What might make you want to play it… Or not? In a world of where Lightning Strike and Abrade are played in the most popular deck, three toughness is a bit of a liability on a four casting cost creature; at least one that isn’t doing something absolutely card advantageous on the way in. 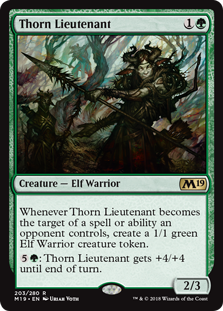 Patrick speculates that the three toughness is a deliberate structural weakness in the card against red — a weakness green doesn’t usually have — for other reasons. Goreclaw costs four. Presumably you hit your land drop the following turn. That’s five. 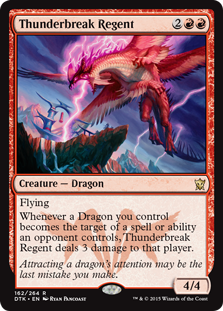 Alongside Goreclaw’s two mana-breaking ability, you can hit something like the new Darigaaz the next turn! Michael is not necessarily convinced. 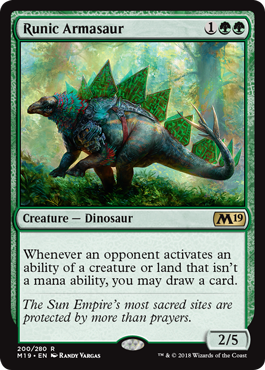 Among other issues, the best five-power [green] creature in the format [by his estimation], Steel Leaf Champion, not only comes down before Goreclaw most of the time… Even when you draw your creatures in the right order, Goreclaw won’t help you cast it. Fine, Fine… How About Runic Armasaur Then? Runic ArmasaurRunic Armasaur has a lot of awesome things going for it. 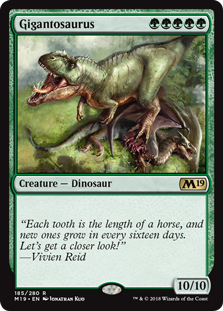 Size-wise, this card is comparable to the ubiquitous Thrashing Brontodon. That’s not a bad place to start. Runic Armasaur isn’t quite big enough to stop Hazoret the Fervent, but five toughness is a big brick wall. Speaking of dinosaurs, If Runic Armosaur is good enough, it may just make Thunderherd Migration good enough. Thrashing Brontodon, Ghalta, Gigantosaurus… There may be just enough dinosaurs to hit critical mass of thunder lizards.